One table, two glasses, single ice cubes slowly softening the spirits. Connection. We all crave it, but again and again we find ourselves feeling disconnected. Disconnected from our communities, our environments, from ourselves. We feel it when our face-to- face interactions are replaced with words on a screen. When we zoom by our neighbors with our windows rolled up and our radio singing. We feel it when we don’t know our collective story, the cultures that have cultivated the land on which our homes rest. When we work long hours or conflicting schedules, missing the ones we love the most, we feel it. Food and drink are fundamental conduits for connection and yet so many of the trends in our culture have stripped them of this identity. Our food and spirits are mass-produced in a far away land, keeping us from seeing the faces of the men and women who grew, harvested, or even delivered it to our local grocery store. We eat in our cars or at our desks, alone. We drink too much or too often or to dull our senses, only further disconnecting us from ourselves and the world swirling around. This wasn’t the reality for Dale Riggins, Brand Manager of Hamilton Distillery (producers of Whiskey Del Bac). She grew up on a barley farm in Coolidge, a 5th generation Arizonan. She experienced what it meant to be connected to the land and what it produced. When she was offered the opportunity to work with the team at Hamilton, there wasn’t a question in her mind. Her eyes were full of life as she told me the story of how this operation came to be. Elaine and Stephen Paul, owner of Hamilton Distillers, once made spectacular furniture out of local mesquite wood. Their company, Arroyo Design, was well recognized as the forerunners for the way they cultivated this tree. One evening, a little over a decade ago, the couple was enjoying Scotch while they barbecued over mesquite scraps. Elaine had a crazy thought. Why couldn’t you use mesquite in place of peat to create a wonderful single-malt whiskey that tastes like home? One distillery, a copper still, and 100% barley- this is American Single Malt Whiskey. It’s a category gaining popularity for craft distillers across The States, and for good reason. As Dale put it: when you only have these 3 requirements, “you can paint whatever you want on it and (at Hamilton) we’re painting on the Sonoran dessert.” Hamilton is one of the relatively few distilleries in the world that completes the whole distillation process in house, from malting to bottling. This makes it so that they can infuse the flavors of the desert all along the way. It’s what is often referred to in the wine world as terroir. 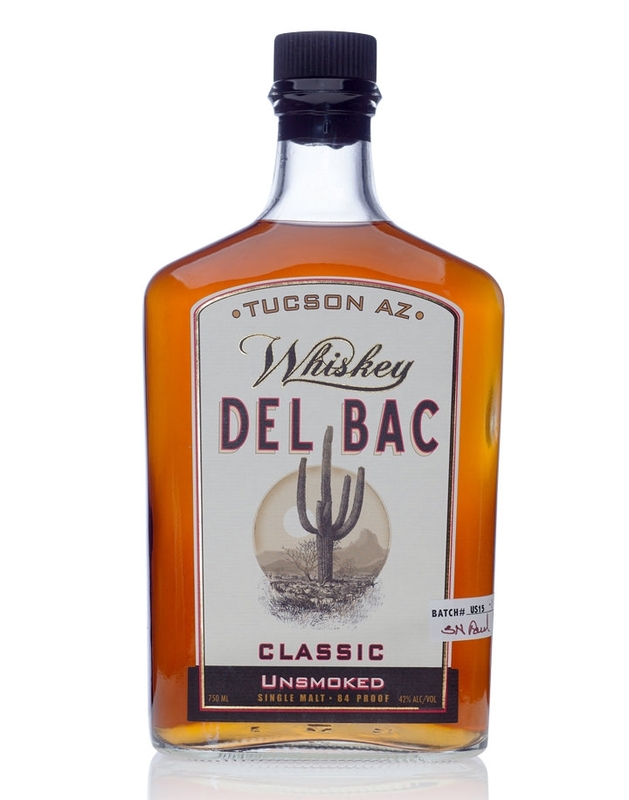 Whiskey Del Bac: A word in English, followed by one in Spanish, finishing with a Tohono O’odham word- meant to represent three of the dominant cultures living together in one place. In living alongside other cultures, we can struggle to see what connects us and to respect what sets us apart. The word Bac means, “where the water rises back out of the sand.” The Santa Cruz River, from which Hamilton sources most of their water, does just that. Water re-emerging from the cracked earth- a gift of life, an invitation to be here. With today’s technology and globalized world, we often fool ourselves into believing that we are no longer dependent on the natural environment or on the people who have come before us. This simply isn’t true. Del Bac reminds us of that by mindfully using local water to help us taste the goodness of the place we all share. Rather than stripping the water of all it has to offer, they only charcoal filter it to remove the chlorine. This is one way that they “paint the Sonoran Desert” on their whiskey. Whiskey Del Bac comes in three original styles- the Dorado, the Clear and the Classic. The malting process for the first two involves smoking the barley over a fire of velvet mesquite from Reddington Pass. This wood infuses its uniquely sweet character that balances the smoke beautifully. They also submitted to the desert climate in their decision to age in new oak barrels (aside from the clear of course!). The warm days and cool nights make the oak expand and contract, imbuing its flavors and allowing the whiskey to reach maturity more quickly. Weather, water, wood- things that every place everywhere has. But they aren’t ever quite the same. The team at Hamilton has been inspired by connecting to the particularities of the world around them and curating something special to our region. In an industry where corners are sometimes cut and mass-production still dominates, the integrity of their work shines through. Each of their whiskeys have won multiple national awards, and have an ever-growing market. But we have the advantage in Tucson of having it readily available. Whether you take a tour at the distillery or pick up a bottle at your local grocery store, it’s hard to miss! And if you prefer to enjoy your whiskey mixed up in a cocktail, nearly all of the bars downtown (and beyond) have a Del Bac original on the menu. All photos courtesy of Hamilton Distillers. For Tours & Tastings at Hamilton Distillers, visit http://hamiltondistillers.com/visit-us. Teena lives in Tucson, Arizona and loves to capture the passions of others with words. Find more of Teena's work at www.shakingspirits.com.